Pandalur and Devala are small towns in the Nilgiris district in Tamil Nadu, within a driving distance of about 6 km. Pandalur and Devala had abundant Gold mines, exploited by the British, and then abandoned to give way to tea plantations instead. Dilapidated mine tunnels can be seen now, left for travelers exploration and makes for photographers paradise. The chief economies of this place are its tea estates. The inhabitants of Pandalur are mostly tribes called the “Paniyas” and the “Gowdas”. The locals are helpful and make Pandalur a tourist-friendly holiday destination in South India. Devala is also called the “Cherrapunji of the south”, as it gets a lot of rain during monsoons. Malayalam and Tamil are the two predominant languages spoken in these two areas, with only a few people, who work on tea plantations or resorts/hotels, speaking in English. 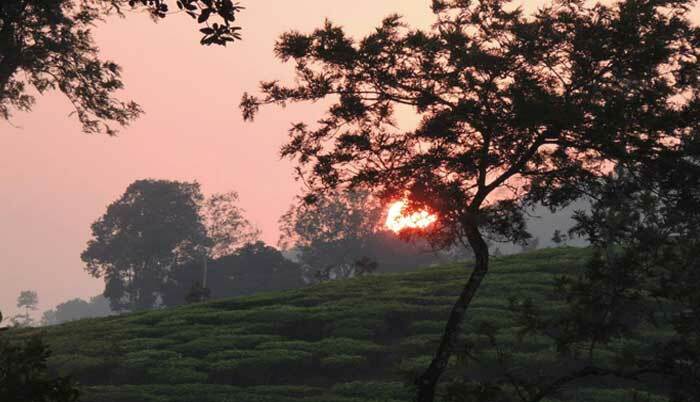 In the lap of the Nilgiris hills, Pandalur – Devala make for a picturesque and scenic landscape with beautiful tea estates and lush green villages. Still largely untouched by the tourism industry, it is ideal for honeymooning couples who like to have a bit of privacy, women and solo travelers who love to explore beautiful yet safe places and is perfect for “Self-Drive Holidays” for families who want to relax away from the humdrum of the busy city life. Pandalur and Devala has a tropical climate throughout the year and receives significant rainfall. The climate is generally pleasant from October-May. The rainy months of June-August are ideal for those committed romantic monsoon lovers and lone honeymooners. Better pack some light to heavy woolen clothes during the winter months. Pandalur and Devala are accessible only through roadway. It is quite close to Gudalur which is a picturesque green valley on the way from Mysore to Ooty. Located strategically from all major cities, they make for perfect weekend getaways into various scenic locales via road. 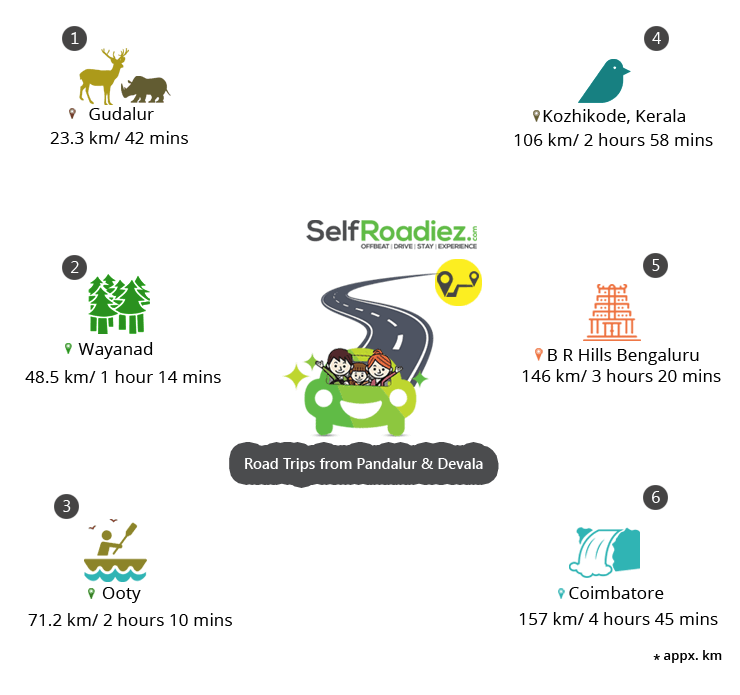 Self-drive car rentals can provide the much-needed cars on hire to make such trips feasible and accessible. The nearest railway station is Kozhikode. It is five hours by road from Kozhikode. Gudalur is a city in Western Tamil Nadu, India. Gudalur is a cheap alternative to Ooty as there is very little traffic and accommodation is not that expensive. Ooty, also known as Udhagamandalam, is a hill station. Surrounded by trees, central Ooty Lake is a huge artificial expanse of water with pleasure boats. On the slopes of nearby Elk Hill, the Rose Garden is home to over 2,000 varieties of roses. The Government Botanical Garden, created in the 19th century, features ferns, orchids and a prehistoric, fossilized tree. Kozhikode is a coastal city in the south Indian state of Kerala. It was a significant spice trade center and is close to Kappad Beach, where Portuguese explorer Vasco da Gama landed in 1498. The central Kozhikode Beach, overlooked by an old lighthouse, is a popular spot for watching the sunset. Inland, tree-lined Mananchira Square, with its musical fountain, surrounds the massive Mananchira Tank, an artificial pond. The Biligirirangana Hills, commonly called BR Hills, is a hill range situated in south-eastern Karnataka, at its border with Tamil Nadu (Erode District) in South India. The area is called Biligiriranganatha Swamy Temple Wildlife Sanctuary or simply BRT Wildlife Sanctuary. It is a protected reserve under the Wildlife Protection Act of 1972. Being at the confluence of the Western Ghats and the Eastern Ghats, the sanctuary is home to ecosystems that are unique to both the mountain ranges. The site was declared a tiger reserve in January 2011 by the Karnataka government, a few months after approval from India’s National Tiger Conservation Authority. Coimbatore is a city in the south Indian state of Tamil Nadu. To the northwest is the centuries-old, Dravidian-style Arulmigu Subramaniyaswami Temple, Marudamalai. The colorful and intricately carved Arulmigu Patteeswarar Swamy Temple lies southeast of here. In the center, the Gass Forest Museum has a huge collection of preserved animals and tree trunks. Southeast, birds, and butterflies inhabit Singanallur Lake. As these offbeat regions in Pandalur/Devala area are not yet commercially exploited, you will be able to find many quaint places of peace and solitude. A remote, adventurous, romantic & unique resort at Devala, sits right amidst the jungle. Wake up to the chirping of birds, stroll among the tea bushes, go for a relaxing swim, warm yourself by the bonfire on cold evenings, and cuddle up under the warm blankets at night to the hooting of owls. The resort also boasts of a natural water body on its premises which provides ample opportunity for freshwater angling. This estate bungalow is tucked away in a 99 acre plantation, which is home to a bevy of trees and endless coffee and tea gardens. With well-provided for rooms and surroundings that can only calm and relax the mind, this estate bungalow plays the perfect host for every soul that seeks a blissful holiday. This British bungalow, built around the year 1918, has only three rooms. All rooms are large and have their own sit-out and veranda. The bedrooms are still in their authentic form and super comfortable. Blissfully enjoy the misty mornings and evenings on the sit-out with a cup of tea or a book in hand. Take some time to enjoy the view of the garden and the green plantations from the veranda. Being a hill station, it is always preferable to carry warm clothes as well as an umbrella. Don’t forget your walking shoes as this destination is a walker’s delight with its scenic views.